The principal author of this book, together with the Medical Hygiene Institute in Russia and several wastewater treatment plants, conducted research on aerobic sludge digestion (Turovskiy, 2001). The object of this research was to obtain sanitarily harmless biosolids with an effective sludge digestion technology that was also cost-effective. transforms into bound water with solids. Unthickened activated sludge usually has lower specific resistance and better dewatering capabilities than those of thickened sludge. On the other hand, digesting unthickened activated sludge does not make sense, due to the large volume and low initial concentration of solids. The kinetics of activated sludge thickening allows determining the rational time of thickening and concentration of solids. Detention Time The duration of the volatile phase of solids oxidation depends on the food/microorganism ratio, the sludge temperature, and the intensity and quantity of air supplied. The wastewater composition also plays a role. 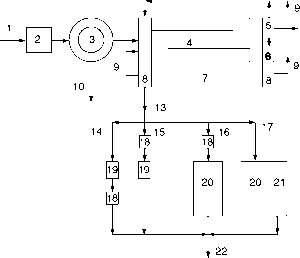 The process of aerobic digestion of a sludge's organics and biomass was described by equations (4.1) through (4.7). At the beginning of the aerobic digestion process, oxidation of organic contaminants takes place. This process is followed by its mineralization, and finally, by self-oxidation and disintegration of the biomass. In digestion process studies, volatile solids were reduced 5 to 50%, fat 65 to 75%, and protein 20 to 30%. Activated sludge needs 7 to 10 days to stabilize; primary sludge takes 20 to 30 days at 20°C. At 8 to 10°C, stabilization takes 2 to 2.5 times longer. Thickened activated sludge needs a longer detention time to stabilize volatile solids. Figure 4.10 shows how volatile solids decrease in activated sludge digestion. If the initial volatile solids concentration is equated to 100%, after 7 to 10 days of digestion at a solids concentration of 10 to 18 kg/m3, the solids content is 32 to 37% (line 1 in Figure 4.10); at 18 to 24 kg/m3, the solids content is 25 to 33% (line 2 in Figure 4.10); and at 24 to 30 kg/m3, the solids content is 15 to 23% (line 3 in Figure 4.10). Table 4.4 illustrates changes in specific resistance during the aerobic digestion of activated sludge. A long detention time decreases the dewater-ability of digested sludge. However, in several experiments, the specific resistance of digested sludge decreased. An effective process may be achieved by thickening the activated sludge 4 to 6 hours before digestion and with a digestion time of 3 to 5 days. Some reduction of specific resistance takes place when the organic part of sludge disintegrates and the solids become heavier. Figure 4.10 Volatile solids reduction versus detention time in activated sludge system. at 20°C. When volatile solids decrease, the air consumption also decreases. This fact can be put into practical use by reducing the aeration to lower and lower rates as detention time increases. However, auxiliary mixing should be provided to prevent the solids from settling to the bottom of the digester. The oxygen requirement for a mixture of waste activated sludge and primary sludge at the beginning of the digestion process is 5 to 10 times more than that needed for activated sludge alone. Compared to activated sludge, the aerobic digestion of sludge from primary clarifiers needs more oxygen, a longer detention time, and increases specific resistance. Disinfection Aerobic digestion of activated sludge with a detention time of 40 days and at a temperature of 20°C. leads to relatively safe levels of coli-forms and pathogenic viruses. Reduction in indicator organisms and viruses from 70 to 99% takes place in 10 days at 20°C. A larger microbial population can be found in agricultural soils (Lue-Hing et al., 1998). One of the possible causes of pathogen destruction is the high Eh-potential of the digestion process (200 to 700 mV). Aerobic digestion destroys only part of the helminth ova. These eggs number several hundreds in 1 kg of aerobically digested sludge, and they can survive a long time. Experiments showed that helminth ova could be destroyed by heating digested sludge at 50°C for 2 hours, at 60°C for a few minutes, and at 70°C for a few seconds (Turovskiy, 1999). After mechanically dewatering and heating sludge to 65°C, aerobically digested sludge revealed no presence of the intestinal typhoid group of bacteria on Wilson-Bleaur, Ploshiryov, or Miller Kaufman medium, or on media with different inhibitors. Studies also showed that because of the extreme changeability of the colon bacillus (revealed in the process of reactivation), there should be no fear of livability or virulence of pathogenic microbes during the utilization of dewatered heated biosolids. 1- Wastewater inflow, 2 - Screening and grit removal, 3 - Primary clarifier, 4 - Aeration tank, 5 - Secondary clarifier, 6 - Sludge thickener, 7 - Aerobic digester, 8 - Thickening zone, 9 - Supernatant, 10 - Primary sludge to treatment, 11 - Return activated sludge, 12 - Treated effluent, 13 - Digested sludge, 14, 15, 16, 17 -Variations of disinfecting and dewatering of digested sludge, 18 - Sludge heater, 19 - Mechanical dewatering, 20 - Drying beds, 21 - Composting, 22 - Disinfected biosolids as fertilizer. Figure 4.11 Technical improvements for aerobic digestion and disinfection of sludge. useful biosolids. For small municipal wastewater treatment plants treating up to 1500 m3/d (0.4 mgd) and with BOD up to 150 mg/L, a scheme without primary clarifiers can be used. Waste activated sludge is thickened in a special zone inside the digester. The duration of thickening should be 3 to 5 hours, with a concentration of thickened sludge at 10 to 13 g/L. In this scheme, the detention time of activated sludge digestion should be 5 to 8 days with an aeration rate of 1 m3/h of air per cubic meter of sludge. Sedimentation time for digested sludge is 1.5 to 3 hours. Supernatant with a BOD value of about 100 mg/L is recycled to the aeration tank. After sedimentation, the digested sludge with solids concentration of 1.5 to 2.5% goes to a heater, where it is heated to 70°C and then discharged to drying beds. 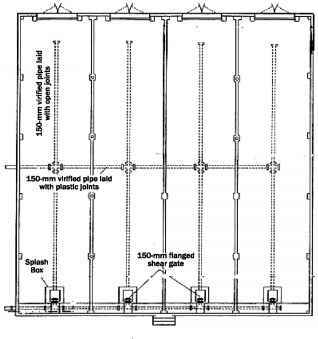 The loading rate of drying beds in a region with a mean annual ambient temperature of 4 to 6°C and annual precipitation of up to 500 mm can be 3 m3/m2 of drying bed per year. The resulting biosolids have moisture content of 75 to 80% and can be used as agricultural fertilizer. For treatment plants treating 1500 to 5000 m3/d (0.4 to 1.3 mgd), a scheme that includes primary clarifiers and aerobic digestion of combined primary sludge and thickened waste activated sludge can be used. The duration of thickening waste activated sludge should be 5 to 6 hours to produce a solids concentration of 13 to 15 g/L. The detention time in the digester should be 10 to 15 days at 20°C, and the aeration rate should be 6 m3/h of air per cubic meter of combined sludge. This technology has been implemented at several treatment plants in Russia. Experience has also shown that in northern regions in winter, when the temperature drops to -30°C and the digester temperature is about 3°C, the efficiency of this technology can be improved by discharging to the digesters a mixture of mixed liquor from the aeration tanks and the waste activated sludge, and by warming the primary sludge to 60°C or by heating the air supply. Two to four hours of thickening of digested sludge yields a dry solids concentration of 3 to 4%. Thickened digested sludge is normally pumped to the drying beds. The drying bed loading rate is 2 m3/m2 of drying bed per year. Dewatered sludge from drying beds with a moisture content of 70 to 78% is composted with bulking materials such as sawdust, wood chips, and compost. 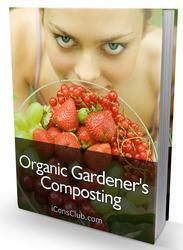 The composted biosolids are a good organic fertilizer. For wastewater treatment plants with a capacity of more than 5000 m3/d (1.3 mgd), an effective scheme includes separate treatment of waste activated sludge and primary sludge (e.g., aerobic digestion of waste activated sludge and anaerobic digestion of primary sludge). In this scheme, waste activated sludge is thickened 3 to 8 hours to a solids concentration of 10 to 18 g/L and discharged to the aerobic digester. Digester detention time is 7 to 10 days with air consumption being 2 m3/h per cubic meter of sludge at a temperature of 20°C. Digested sludge is concentrated for 3 to 5 hours to 2.5 to 3.0% dry solids. The thickened digested sludge is dewatered using belt filter presses or centrifuges. Due to the low specific resistance, relatively less polymer is required for dewatering. For disinfecting, the sludge is heated to 70°C before or after dewatering. The dewatered sludge may be used as organic fertilizer. Overall, the studies proved that heating of digested sludge allows digestion of waste activated sludge of low concentrations at reduced detention time, which results in smaller thickeners and digesters. In addition, the scheme of separate treatment of waste activated sludge and primary sludge is very efficient because of the decrease in detention time and air consumption and the improved dewaterability of digested sludge. The technological improvements produce biosolids that meet class A or class B requirements of the 40 CFR Part 503 regulations. Ahlberg, N. R., and Boyko, B. I. (1972), Evaluation and Design of Aerobic Digesters, Journal of the Water Pollution Control Federation, Vol. 44, p. 634. Benefield, L. D., et al. (1978), Design Relationships for Aerobic Digestion, Journal of the Water Pollution Control Federation, Vol. 50, p. 518. Benefield, L. D., and Randall, C. W. (1980), Biological Process Design for Wastewater Treatment, Prentice-Hall, Englewood Cliffs, NJ. Chu, A., and Mavinic, D. S. (1998), The Effects of Macromolecular Substrates and a Metabolic Inhibitor on Volatile Fatty Acid Metabolism in Thermophilic Aerobic Digestion, Water Science and Technology, Vol. 38, No. 55. Deeney, F. B., et al. (1991), Autothermal Thermophilic Aerobic Digestion, Water Environment and Technology, Vol. 65. Enviroquip (1997), Aerobic Digestion Workshop, Vol. 1, Enviroquip, Inc., Austin, TX. Eyma, R., et al. (1999), Thermophilic Aerobic Digestion to Achieve Class A Biosolids, Florida Water Resources Journal, December, pp. 24-28. Farrell, J. (1999), Summary of Designs, in Aerobic Digestion Workshop, Vol. III, Enviroquip, Inc., Austin, TX. Fuchs ATAD Systems, Autothermal Thermophilic Aerobic Digestion, I. Kruger, Inc., Cary, NC. Ganczarczyk, J., Hamoda, M. F., and Wong, H. L. (1980), Performance of Aerobic Digestion at Different Sludge Solids Levels and Operating Patterns, Water Research, Vol. 14, No. 11, pp. 627-633. Hartman, R. B., et al. (1979), Sludge Stabilization Through Aerobic Digestion, Journal of the Water Pollution Control Federation, Vol. 51, p. 2353. Jewell, W. J., and Kabrick, R. M. (1980), Autoheated Aerobic Thermophilic Digestion with Air Aeration, Journal of the Water Pollution Control Federation, Vol. 52, p. 512. Kelly, H. G. (1991a), Autothermal Thermophilic Aerobic Digestion: A Two-Year Appraisal of Canadian Facilities, Proceedings of the Environmental Engineering Specialty Conference, ASCE, Reno, NV. -(1991b), Autothermal Thermophilic Digestion of Municipal Sludge: Conclusion of a One-Year Full-Scale Demonstration Project, presented at the 64th Annual Conference of the Water Pollution Control Federation, Ontario, Canada. Full-Scale Demonstration Project, Water Environment Research, Vol. 65, p. 849. Koers, D. A., and Mavinic, D. S. (1977), Aerobic Digestion of Waste Activated Sludge at Low Temperatures, Journal of the Water Pollution Control Federation, Vol. 49, No. 3, p. 460. 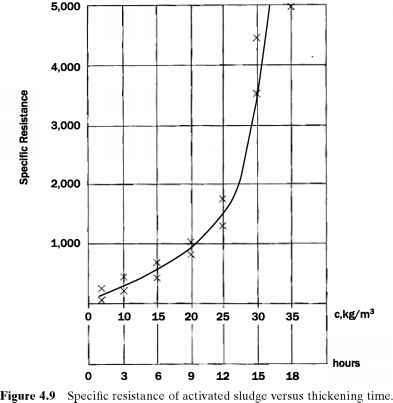 Krishnamoorthy, R., and Loehr, R. C. (1989), Aerobic Sludge Stabilization: Factors Affecting Kinetics, ASCE Journal of the Environmental Engineering Digestion, Vol. 115, pp. 283-301. Mavinic, D. S., and Koers, D. A. (1979), Performance and Kinetics of Low Temperature, Aerobic Sludge Digestion, Journal of the Water Pollution Control Federation, Vol. 51, p. 2088. Maxwell, M. J., et al. (1992), Impact of New Sludge Regulations on Aerobic Digester Sizing and Cost-Effectiveness, Proceedings of the Water Environment Federation 65th Annual Conference and Exposition, New Orleans, LA. Murray, K. C., et al. (1990), Thermophilic Aerobic Digestion: A Reliable and Effective Process for Sludge Treatment at Small Works, Water Science and Technology, Vol. 22, p. 225. Pride, C. (2002), ATADs, Odor and Biofilters, Florida Water Resources Journal, April, pp. 18, 20, 25, 26. Porteous, J. (1998), Controlled Aerobic Digestion of Thickened Sludge, Water Engineering and Management, August, pp. 26-28. Randall, C. W., et al. 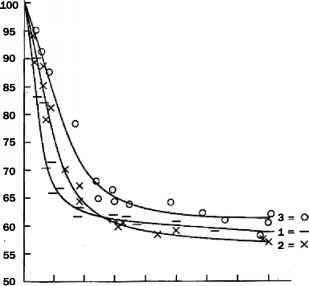 (1975), Temperature Effects on Aerobic Digestion Kineties, ASCE Journal of the Environmental Engineering Division, Vol. 101, p. 795. Reynolds, T. D. (1973), Aerobic Digestion of Thickened Waste Activated Sludge, Proceedings of the 28th Purdue Industrial Waste Conference, Purdue University, Lafayette, IN, pp. 12-37. Roediger, M., and Vivona, M. A. (1998), Process for Pathogen Reduction to Produce Class A Solids, Proceedings of the 71st Annual Conference and Exposition, Water Environment Federation, Alexandria, VA, pp. 137-148. Turovskiy, I. S. (1998), New Technology for Wastewater and Sludge Treatment in Northern Region, Water Engineering and Management, May, pp. 40-43, 56. Water Engineering and Management, August, pp. 33-36. U.S. EPA (1974), Process Design Manual for Upgrading Existing Wastewater Treatment Plants, EPA 625/1-71/004a. -(1989), Design Manual: Fine Pore Aerator Systems, EPA 625/9-89/023. WEF (1987), Aerobic Sludge Digestion, Manual of Practice 16, Water Environment Federation, Alexandria, VA.
11, Water Environment Federation, Alexandria, VA.
Wolinski, W. K. (1985), Aerobic Thermophilic Sludge Stabilization Using Air, Water Pollution Control, p. 433.